The Magic: How the Butterfly Bush works: Buddleia or Butterfly Bush has been a sensation in American gardens for years, and no wonder. This plant is easy to grow, blooms profusely, and has that magical quality: Butterflies cant resist it. Here's why: Its not just the pretty flowers that attract the butterflies, like any bright flower. Buddleias emit a special honey-scented fragrance that lures butterflies like a moth to a light, and then once there, they find the flowers super-rich in nectar. A butterfly bush in the garden will often be seen with a mass of butterflies on the flowers, especially during hot sunny afternoons. Buddleias attract other insects too, like moths, and the reddish ones strongly attract hummingbirds. So its more than a name; its actually a botanical phenomenon. Open the box immediately, protect from cold, and water each potted plant. Some of your butterfly bush plants may have new green growth and some may not. If you see no leaves, don't worry; this is normal. The roots in the pot are healthy and ready to grow in your garden. Plant as soon as you can. If your weather cooperates (above freezing), begin planting as soon as possible. If not, keep your butterfly bushes where they get some sun through a window, and keep them moist, not soggy. As you set out your potted butterfly bushes, dig to loosen the soil around and below the actual spot, and then set the rooted plant at the same level if was growing in the pot. Plant your butterfly bushes about 4-6' apart, depending on the variety. When you remove the plant from the pot, do not pull on the leaves or stems. Squeeze the pot a little and the roots and soil will slide out for you. Water well after planting, and continue to water at least every two weeks, depending on rainfall. Butterfly bushes are popular and hardy from Zone 5 south to Zone 9. In the colder zones, they die to the ground each year like a perennial plants, but in more southern regions, they are somewhat evergreen. In the warmer states, butterfly bushes often grow to 10 or 12 ft. high, and require pruning to keep them shapely. They're happy in almost any soil and prefer moist ground, but will also do well in dryer spots. They need plenty of sun, but will be fine with some shade in the warmer areas. All this tells you that this plant is a tough one, and should be easy to grow in your garden. A well-grown specimen can be a magnificent "fountain" of flowers, since the stems with heavy flower clusters tend to arch in all directions. The colors and named varieties. You'll find pink, white, blue, and some very beautiful new bi-colors. Buddleia "Bicolor" created a sensation when it burst on the scene. It is one of the first with bi-colored blooms, often developing long clusters that range from bluish to raspberry to bright orange as you look from the tip to the base of the flower spike. 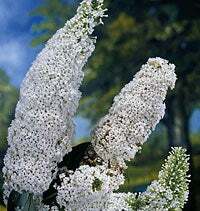 Some botanists think the basic white butterfly bush has the most potent lure for insects. That's "White Profusion" with it's very heavy flower heads shown on the right. A butterfly bush with pink, blue and white flowers on the same plant? Hmmm. If you've ever heard about this magical butterfly bush, I think I know why. 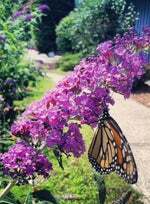 During the 1990's a very well know perennial nursery, which shall remain nameless, began selling "a butterfly bush with three colors on the same plant." The offer was such a successful bonanza for them, they repeated it over and over in ad after ad. And hundreds of thousands of gardeners bought. Well, what they got was really three small seedlings of three different plants grouped into one pot—one white, one blue and one pink. It all worked well, since butterfly bushes grow so easily and quickly, it really did look like one leafy bush as it grew. But once the "bush" was up and blooming with all the colors, if you looked closely near the ground, you'd see three little trunks, not just one. The effect was definitely one handsome bush with blooms in all three colors, but it was simply three different bushes planted very close together. New butterfly bushes to come? The genus Buddleia (or Buddleja to be correct) is a group of several wild species that are cultivated and hybridized for the plants we enjoy. Most are from China, but some have been imported from South America as well. 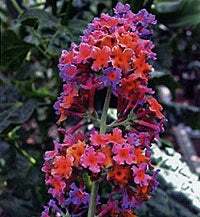 The most popular is B. davidii, which was brought into England's Kew Gardens in the 1880's, and is the parent of all the well-known butterfly bushes. However, according to "The Butterfly Website", some naturalists are still seeking out unknown species of Buddleia on the slopes of the Himalayas. Don't confuse the butterfly bush with butterfly weed.